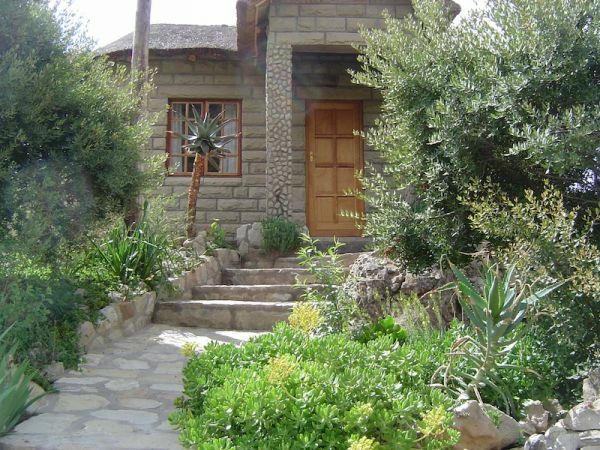 The Morija Guest House is perched on a rocky outcrop overlooking the historic village of Morija, in the Lesotho Lowlands (45 km from the capital Maseru). Built of handcut stone and thatched with local grass, it blends discreetly into the environment. During the day there are commanding views of the surrounding forest and the village below. The sunsets from the front deck and the views of the night sky are unforgettable. Below the main house, there are small cottages to welcome more visitors. The accommodation offered is rustic but comfortable and the rooms are tastefully decorated. We can welcome 24 people comfortably (see details under ""Facilities""). Guests can choose to cater for themselves or to order cooked meals. We are proud of our homely atmosphere where families, NGOs, church groups and professionals all feel at ease. We also organise special weekends, some to introduce visitors to the language and the culture of Lesotho, and others to teach French, with accommodation, meals and activities all being included.